Home prices in the city of Los Angeles rose 7.1 percent in July from a year earlier, to $600,000 – nearly double the closing price for an L.A. home five years ago. The number of homes for sale continued its upward trend in July, as inventory increased 12.4 percent from last year. 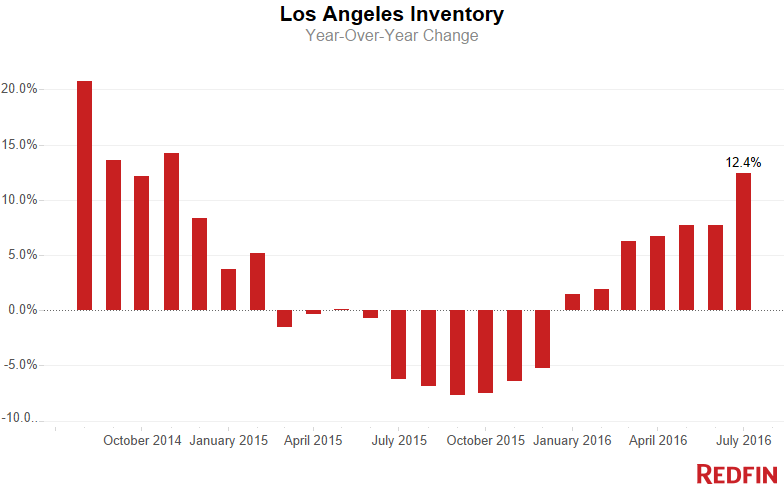 There were about 7,200 homes for sale overall in July – the largest number of homes for sale in L.A. since June 2012. 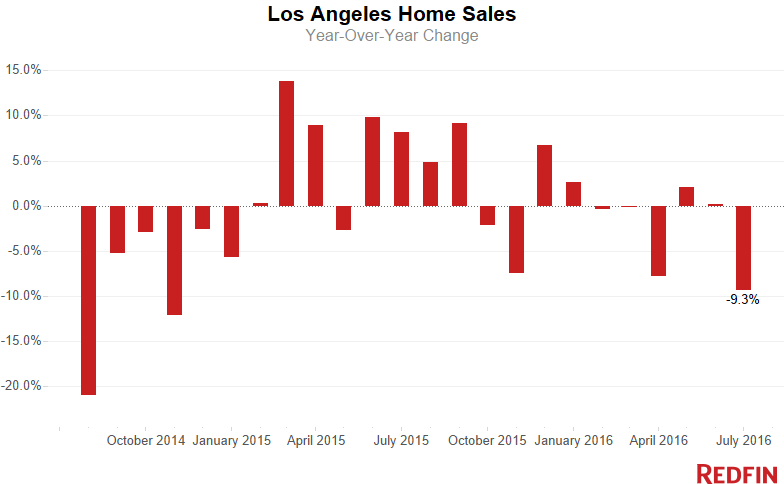 Home prices in the city of Los Angeles rose 7.1 percent in July from a year earlier, to $600,000 – nearly double the price buyers were paying for an L.A. home five years ago. Home sales declined significantly, falling 9.3 percent compared to last July, mirroring a nationwide trend of declining sales activity. 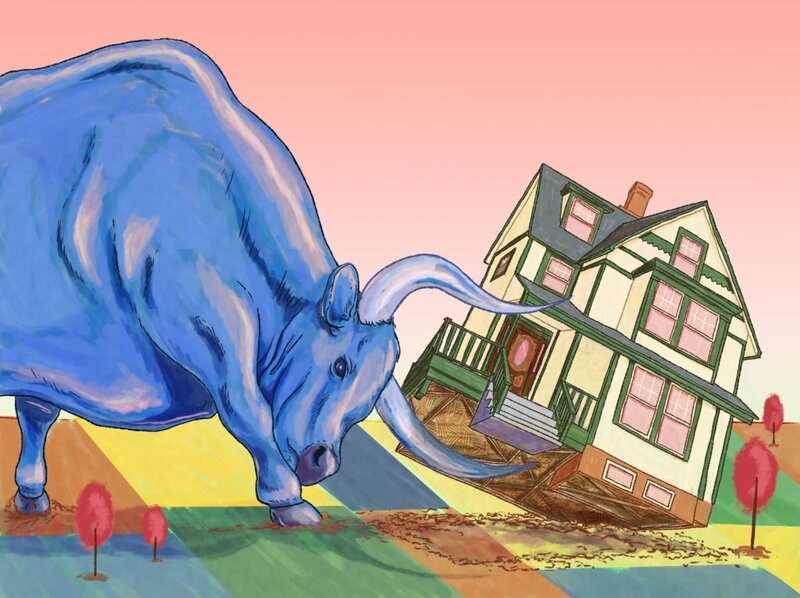 Redfin analysts estimate that the large drop in sales is at least partially due to the way the calendar was laid out, with a below-average number of business days this July and an above-average number last July. Just the fact that there were fewer days for closings to take place is estimated to have contributed to a 7.5 percent drop in sales nationwide. The number of homes for sale continued its upward trend in July, as inventory increased 12.4 percent from last year. Although the number of homes for sale has increased substantially, there still remains a scant 2.7 months supply. Although six months of housing supply is considered balanced, the housing stock has fluctuated between 1.5 and just over three months supply since 2012, when the recovery began to pick up steam. New listings grew by only 4 percent over last year (about 200 homes more than one year ago), yet there were about 7,200 homes for sale overall in July — the largest number of homes for sale in L.A. since June 2012. At the same time, the median asking price in June, when many offers that eventually close in July are made, was $650,000, which is the highest median list price on record since Redfin began tracking this data in 2009. Homes sat on the market for about 30 days, a full week longer than the same period last year. The fastest markets were Fox Hills and Eagle Rock, where the typical home sold in 13 and 17 days, respectively. 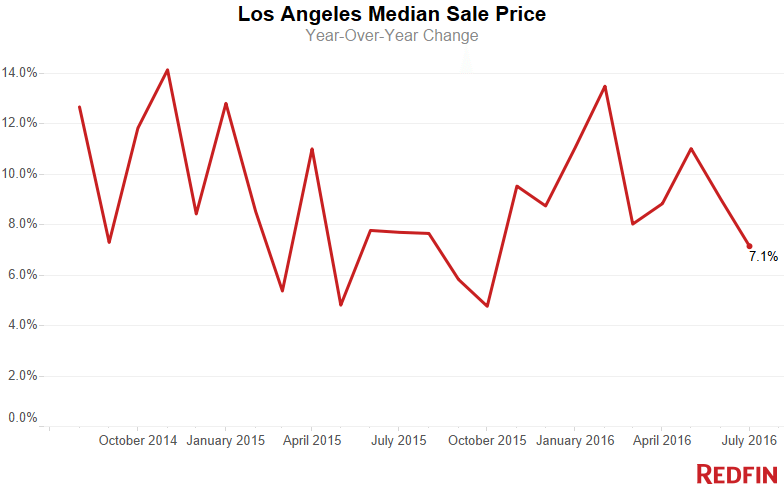 Tarzana and Brentwood both saw the largest annual price increases of the neighborhoods Redfin tracks. Prices climbed 37.8 percent in Tarzana to a median sale price of $675,000 and by 36.5 percent in Brentwood to $1,825,000. There was a handful of neighborhoods in July where more than 50 percent of the homes sold for more than the asking price. But more than 60 percent of homes sold in Fox Hills and Crenshaw sold above list. It’s no coincidence that both of these neighborhoods are centrally located in L.A. and have median sale prices below $500,000.